All 118 Conservative MPs and her minority government “prop-upers” the DUP who had voted against her Withdrawal Bill, and not forgetting in those numbers were the 100 plus Tory MPs who tried to bring her down as PM only a few months ago, switched back en-masse in support. Some with a tremendous show of public enthusiasm. It’s no wonder so many people are utterly bewildered by the machinations which make up much of our daily lives in Westminster these days. What is true, though, is we are in a genuinely challenging place at the minute. So what are the Prime Minister’s options? Perhaps go back to the EU to try and get something more on the Northern Ireland backstop, meet with other party leaders to see what might get through Parliament, or even, resign and another Tory leader tries to get a deal through the House. Or move the deal onto the softer Brexit of a Norway deal or toward a harder Brexit of a no deal. Who knows? Theresa May could even go against everything that she’s been saying and suddenly advocate a second referendum. Unlikely perhaps, but we really are in uncharted territory right now. To be frank it’s a mess and literally anything could happen moving forward. From my own perspective, over the last few days, I’ve reflected long and hard about how once I’d supported the government’s original Withdrawal Bill, as I always promised, would that commitment be fulfilled and therefore done with? My decision is that such a view doesn’t feel right to me. I am sure with a little sophistry and personal self-denial I could persuade myself that I’d fulfilled my promise, but in my heart of hearts, I’d know I’d be lying to both myself and to you, the residents of Eastbourne and Willingdon. Something I am not prepared to do. I believe that if I did I’d be breaking the spirit of my original promise to the town, which has always been to support a Withdrawal Bill from the EU. Not just “the first one that comes down the pipe” but a Bill put before Parliament. Obviously I couldn’t have known two-and-three-quarter years later this shambolic government’s initial Withdrawal Bill would fail so spectacularly, but we are where we are. And now; what a ‘final’ Withdrawal Bill consists of - or even if it will happen - who knows? 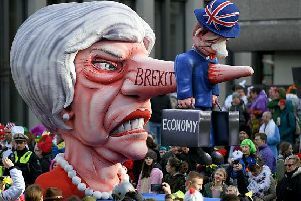 Meanwhile, the exit date continues to wind down remorselessly toward March 29 and the dangers of a ‘no deal’ crash-out from the EU loom. As you know I have always publicly stated my opposition to a ‘no deal’ withdrawal and I will vote accordingly in Westminster - but the clock is ticking. In conclusion, there are two things which are really important to me over this whole lamentable situation; firstly, I am determined to do the right thing by Eastbourne and, secondly, that I do so with integrity. Our beloved town and all it stands for means a lot to me. It really does. Serving you with honour, even if at times we may disagree, is what I try to do every day of every week as your MP. The Brexit issue has divided people right across the UK and of course this includes people in the constituency. I respect the strength of all these views, which is why I felt it important that you, the readers of the Herald, know exactly what my stance is since Tuesday’s important vote. It remains unchanged in that I will continue supporting a Brexit Withdrawal Bill as and when it returns, and not back calls for a second referendum. When I give my word to you all, I keep it.